As if the Dino Building can’t hold anymore the influx of prehistoric animals flooding our farm, FarmVille will be releasing a new prehistoric pen the Extinct Animal Zoo that will hold the new class of extinct animals. The Extinct Animal Zoo will not serve as storage but Farm Ville farmers can also create and unlock new animals using the fossils or materials that the pen produce. 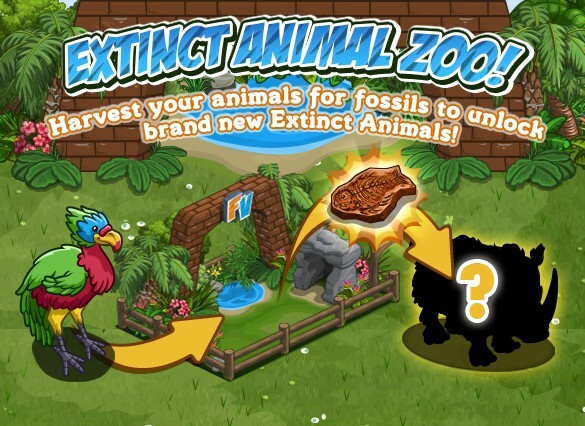 There will be 5 different fossils that the FarmVille Extinct Animal Zoo can produce. Now depending on which animal the Extinct Animal Zoo currently hold on which fossils it may produce. Players must collect and complete first the parts or materials the building requires in order to build it. I think it would be better if the animals were proper extinct animals, not dressed up fancy ones with spectacles and scuba gear.